I'm not sure if "wardrobing" is even a word but we're going with it anyway! ;) I have shared in the past about our pursuit of minimalism, which really started after Olivia was born in 2013. Over the past 4 years I have learned more about what it means to live with less and more simply, and it has changed our life for the better in so many ways. We own less stuff now, with 3 little girls, than we did when we got married 5 years ago and it was just the two of us. You can find lots of information on why we love this lifestyle and finds lots of my favorite articles on my minimal living page here. One area I have really loved keeping minimal is our girls' wardrobes. I would describe them as a cross between a minimal + capsule wardrobe and I get lots of questions about what I buy, where I shop and how I do it so I thought it would be so much fun to share here on the blog, especially with the Fall season ahead! Right now we keep all of Olivia's clothes in her dresser, which is 4 drawers, but the bottom drawer is her blankets & animals and the top drawer is pajamas, socks & linens (extra sheets, pillowcases, etc) so it's mainly two drawers occupied with her actual clothing. Penelope and Adaline share a 6-drawer dresser, which contains 1 drawer of daily essentials (combs, socks, toiletries, medicine, etc), 1 drawer of bows and 1 drawer of blankets. All of Adaline's clothing fits in one drawer and all of Penelope's clothing fits in two, her pajamas & play clothes in one and then her daily outfits in the other. All of the girls' bedrooms have large closets but we use them for storage of diapers, wipes, seasonal books, toys, and then some of our clothes. It's important to me that I have a handful of high quality, classic pieces for each of my girls that transition through all seasons, can be dressed up or down and will last from one to the next. I'd rather invest a little more in 5 pieces, for example, than buy 20 cheaper ones that will have holes or wash wear after a month. I use accessories like shoes, bows, bonnets and tights to create different looks while still keeping the staple pieces pretty simple. Olivia is almost 4.5 and has the most clothes out of all 3 girls. She has a mix of small shop pieces (my favorite clothing to dress her in) and then simple, inexpensive staples (mostly from Gap, Old Navy & Tea) that are great for everyday wear, school and trips to Nana's house (because she always seems to spill something when she is at Nana's). Dresses // I counted the other day and she has 14 total Alice and Ames dresses, which seems like a lot, but they have been purchased a few at a time over the past 18 months and she wears them every day. I usually add 2-4 to her wardrobe per season (I picked up ivory dot and dutch blue this Fall) and keep a variety of long sleeve & short sleeve ones so that they work for all seasons. In the Fall, she wears them with tights or leggings. In the Winter, she wears them with vests or coats and leggings & boots. In the Spring, she wears a jean jacket over them, and then Summertime she wears them just by themselves. They can be dressed up for photo sessions or special events but also make a great everyday staple for school, playdates and are even cozy enough to nap or lounge in. She also has a few heirloom dresses (we love Wren & James pinafores) which have been used for photo sessions or very special occasions. These are very special to me and pieces I always hold on to for her baby sisters. Childhoods Pieces // We love Childhoods brand clothing. It is SO cozy, made in the US and is created to last. She has one hoodie, a slouch tee and then two ribbon skirts. I will be adding a few pieces this September when they release their new peplum crews and ribbon dresses, two of our fav styles! In the Fall/Winter, I can throw the skirts on over leggings or tights, the sweatshirt works year round to put on top of whatever she is wearing if it's cool out and the slouch tee, well she lives in that and it's pretty much my favorite too. Tops // For Fall I've picked up a few simple, neutral tops and sweaters (mostly from Gap & Old Navy) that she can wear to school and I don't mind if she spills paint or glue on ;) I keep 6 or less tops on hand at all times for her, because she primarily wears dresses. She is in a 5T right now but also fits XS in Girls clothing, so I made sure to get pieces that she will be able to wear again all next year. This summer she wore the tops I had purchased last Summer and now she has just begun growing out of them, so I either pass them along to friends, donate or resell. 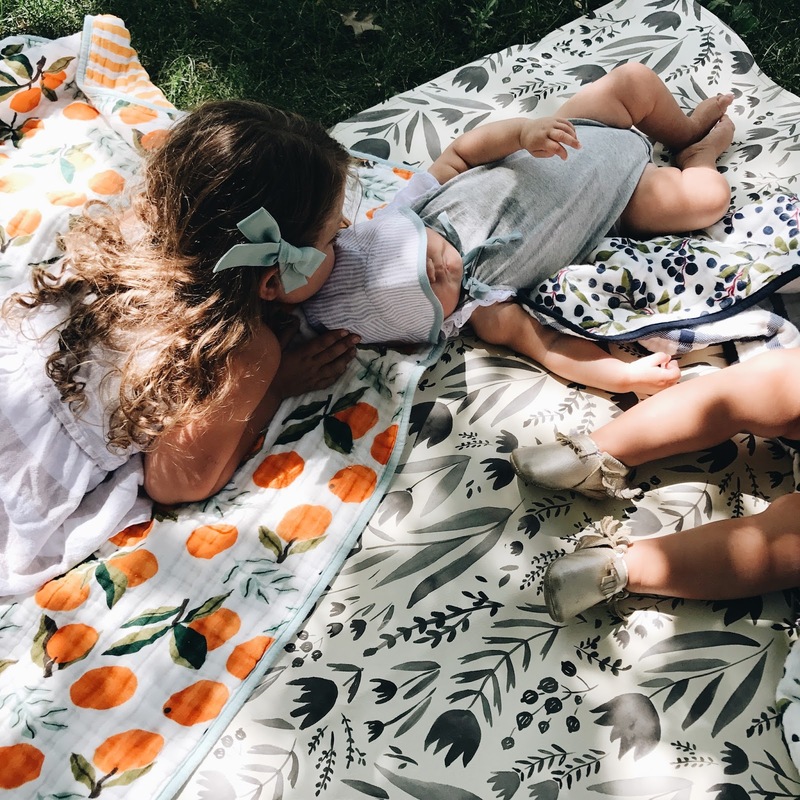 I rarely hold on to clothing that my girls have outgrown, unless it is handmade heirloom dresses, bonnets or really special pieces that I know I want to pass down from sister to sister. Bottoms // Olivia has 3 pairs of jeans, 3 pairs of joggers/lounge pants and about 6 pairs of leggings, all of which are super neutral (black, gray, simple stripes etc). This allows me to pair them with any top or dress year round. She also has 3 pairs of cartwheel shorts, 2 black and 1 white (super inexpensive from Old Navy) which she wears under dresses in the Spring and Summer and one pair of overalls (here; seriously such a fun piece!). Shoes // Olivia has one pair of tennis shoes (here), two pairs of everyday boots (these brown boots are our fav if you are looking for an heirloom quality and want to invest a little more; then I picked up these more inexpensive black ones for this Fall), one pair of neutral brown and white color block sandals and one pair of "park shoes" as we call them, which are breathable, comfortable and sturdy and those are a staple all Spring and Summer long. She also has a pair of Uggs for Winter which she has worn the past two Winters and now they will be given to Poppy and we will get her a new bigger pair. I live in my Uggs all winter long and hers still look brand new after 2 years of wear so investing in a more expensive winter boot (and one that is WARM!) has been totally worth it for us instead of spending $30-$40 ones every Winter that don't last long or keep her feet warm. Jackets & Outerwear // She has a classic light denim jean jacket (perfect for throwing on in Spring and Summer, even into early Fall over whatever she is wearing), a lightweight fleece Columbia zip up (here; this is great for cool weather or under vests in Wintertime...Poppy has the same one and they LOVE them), an army green lightweight jacket (older but similar here) and two heavy winter coats, which I purchased last Winter and she will wear all Winter again and then give to Poppy. One benefit of having 3 girls is that whenever I invest in something, I know it will get wear for 4+ years, especially bulkier pieces like jackets, snow pants, winter boots, etc, that you don't love to buy but that are necessities. Other // Olivia has a handful of our favorite sailor and oversized schoolgirl bows from Wunderkin Co., socks and underwear from Mini Boden and some random pairs of tights. She has two "play" dresses ($5 each from Target) that I pair with black cartwheel shorts; these will be tossed at the end of summer because they are so worn, but we got so much use out of them for the past 6+ months. Last but not least, pajamas. 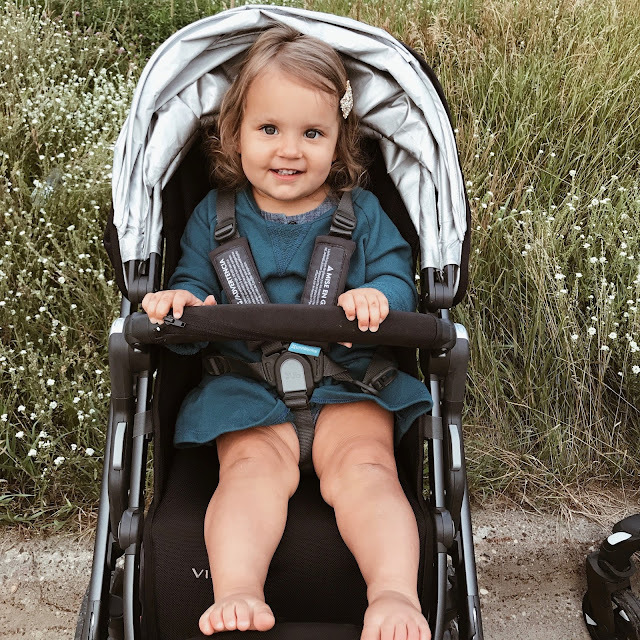 Our favorite places to get them are Boden and Old Navy and when I can match her and Poppy, even better! Dresses // Poppy has a few small shop dresses from last Summer/Fall that she still fits and then a few from this Spring/Summer. She also has a few handmade dresses which she has worn in photos and that she wears for special occasions. We love ribbon dresses from Childhoods and Alice and Ames (Size 2T) dresses for Poppy too. I got her the ivory dot this Fall. Tops // My absolute favorite tops for her are Childhoods Peplum crews (above). She has peplum crews in 3 colors and I pair them with shorts, leggings, bloomers or even throw them on over rompers and dresses. They are definitely a staple in her wardrobe and are so comfy. You can size up and they wear more like dresses. She still fits hers from last Fall and it has probably gone through 100 washes and is still the piece I reach for most often when it's cool out. Bottoms // Poppy has 8 pairs of leggings, most of which we just recently got for Fall from Tea Collection. They are our absolute favorite leggings and come in so many fun patterns. The taffy stripe is one of my favs and the quality can't be beat! She also has classic black leggings, inexpensive Cat & Jack brand ones that she can wear out with no loss. She has a few pairs of black cartwheel shorts, one pair of Childhoods shorties (here) and one Childhoods skirt (here). Jackets & Outerwear // She has this fleece jacket like Olivia, a lightweight green jacket (older but similar here) and then one warm winter coat. Shoes // Poppy has a pair of park shoes, brown boots (here) and a few pairs of our favorite Freshly Picked moccasins, which she wears every single day. Other // Poppy has pajamas that match Olivia's, two play dresses (Cat & Jack brand, same as Olivia's) and then for accessories, bows & hair clips. Our favorite clips for the girls are here (above). Bonnets & onesies are staples for Adaline, and she has the smallest wardrobe of all 3 girls, go figure ;) Our favorite bonnets are Briar Handmade and we love Mini Boden for long sleeve onesies, I have found those to be the best quality. 95% of her clothing was Penelope's so I really haven't purchased hardly anything for her since she was born other than a few super inexpensive tank top/short sleeve onesies that she wore day in and day out all summer long. Adaline also has a few tops and bottoms from Tea Collection which we love (bloomers and leggings to match Poppy), and then three pairs of Pine and Honey Handmade bloomers that I pair with onesies or dresses. She wears onesies by themselves all Spring & Summer and then I love putting them over leggings for Fall/Winter. I also get onesies at Gap, Old Navy and then sometimes small shops like the one above (here). For Della's pajamas and cozy clothing, our favorite brand is L'ovedbaby. 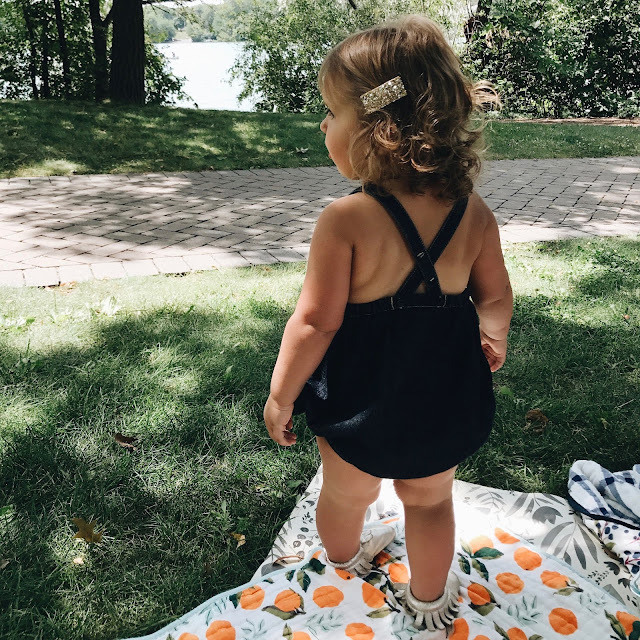 We have been obsessed with their footed rompers since she was born and they are great for babies of all ages and hold up so well even wash after wash. We love their thermals for Fall and their new dots line... seriously polka dots are my favorite! She has a few pairs of shoes (our favorites are Freshly Picked and Mon Petit) and then I got her this lightweight coat for Fall on sale. She is still so tiny so I don't envision her needing a puffy winter jacket but it does get pretty cold here so we will see! I buy all of the girls' "big box" clothing (Gap, Old Navy, etc) on super sale...so I wait until I can get it at 40% off, then get an extra 10% for being a card holder and often have "10% on top" codes that I can add on top of that. THEN I use my Gap rewards to get all their clothing for free or very close to free. I earn the rewards by buying necessities like gas, groceries, etc and using my Gap card. I pay it off each month, then buy their clothes with the rewards. I have a rule that if I am not shopping small, I will never pay full price for anything ;) On the flip side, shopping small is a bit more of an investment but I love knowing that clothing is made in the US by hand and supporting families like my own, so it balances it out. + What pieces are going to transition from season to season? If you have daughters, dresses are a must because they are so easy to modify for any type of weather. For babies, long sleeve onesies are a great transitional piece because you can easily add leggings, sweatshirts or tights. + What pieces are worth investing in and which are better buying inexpensively? Keeping inexpensive pieces on hand like black cartwheel shorts, black leggings and a few play shirts that you don't care much about in turn keeps your more expensive clothing nice because you won't be reaching for that for playdates or going to the park. Pick a few pieces from your favorite small shops that you know you will get tons and tons of wear out of and splurge on those. Think 1 small shop hoodie instead of 4-5 big box store ones. Think 2-3 small shop dresses instead of 6-8 big box store ones. Keeping it simple not only saves you money but so much time and stress too. + What can I pass down? Obviously, the higher the quality of clothing, the better for passing down from child to child. If you find a piece that you aren't going to be able to give to younger siblings (say, the season is off by the time it will fit them), make sure you're not spending much on it. If I am going to splurge on a handmade dress, I will make sure that all 3, or at least 2 of the 3, can wear it. If I am going to be sending Olivia to school in it, I make sure it didn't cost much and doesn't matter if it comes home dirty or worn. + What can I get rid of? This is a huge key in keeping a minimal/capsule wardrobe. It's not just that you don't buy many pieces each season, it's that you get rid of what you no longer want or need, regularly. About every 2-3 months (or every season change), I go through all the girls' clothing and look at what they aren't wearing regularly, what no longer fits or isn't going to last, and what I can't pass down. Then I get rid of it -- by reselling, donating or passing along to friends who will use it. If I held on to every piece of clothing my girls had ever worn, I assure you it wouldn't fit in just a few drawers like their clothing does now. I keep one plastic tub of clothing I have held on to in my closet...a handful of special newborn pieces (all of Della's l'ovedbaby rompers! ), clothing that Poppy or Della will grow in to but that don't fit yet and a few cherished pieces that I'd rather keep than sell. But everything else, I get rid of. + Do I really love it? 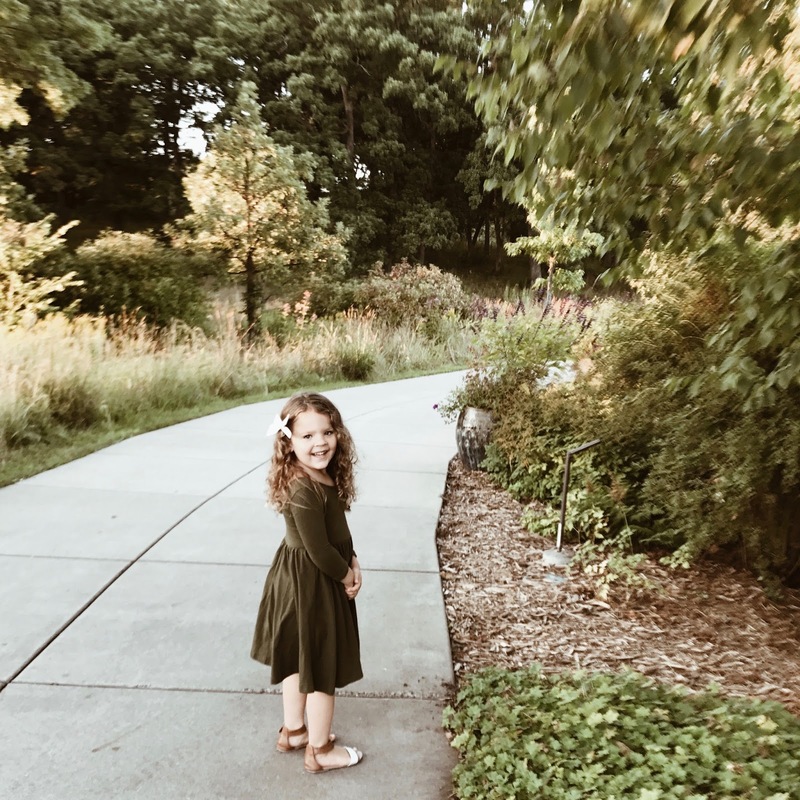 Being that I have been moving toward minimalism for over 4 years, I am really getting to know my style and what I love dressing my girls in, which that has helped me to only buy clothing I truly love. I think long and hard before I purchase clothing for them...I consider the cost, the versatility, the quality, the brand, the likelihood that it will get worn by more than one of my daughters and the overall style of it. Is it something that I'm going to get tired of looking at after a few weeks?? It sounds so silly but when you keep a minimal wardrobe, your kids' outfits get repeated A LOT. You want to make sure the pieces you are bringing in your home and putting in their closets are pieces you truly love. For me, that means timeless, classic, neutral pieces that work for all seasons, transition easily and pair well with their other clothing. Adaline turned 6 months old on August 1st so we have spent the month introducing her to solids! With all 3 of our girls, the first foods we started with were avocado, sweet potato and cooked egg yolks (hard boil eggs, let cool and remove the white then mash up the cooked yolk to add to any & all foods). All three of those are powerhouse foods, chock full of nutrients that our growing babies need for their growth and development. Since then, we've also introduced carrots, blueberries, bananas, pears, butternut squash, beets, zucchini, peas, broccoli and quinoa as well as coconut oil, which I add to most every puree when I blend them for bonus nutrients and healthy fat. When Olivia first began eating solids in 2013, I set out to make my own baby food, then continued doing so with Penelope and now Adaline. But one thing I didn't have the first two times around is the kitchen gadget I reach for most often these days, our Beaba Babycook Plus. 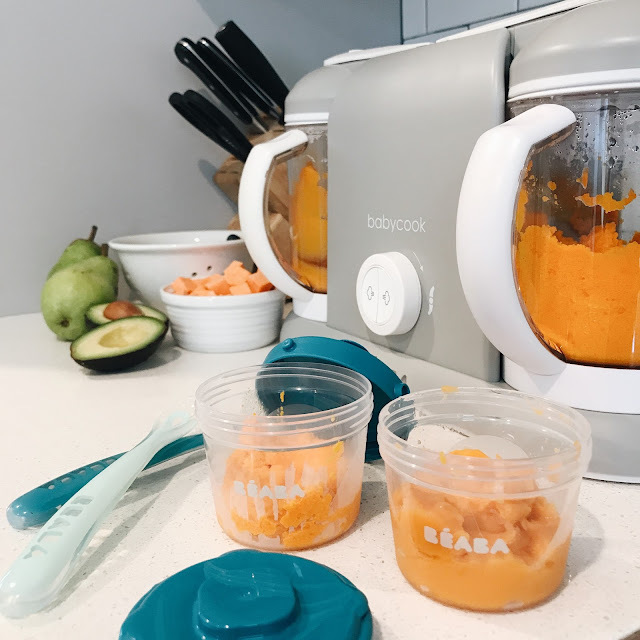 If you haven't heard of a Beaba Babycook, it is a sleek, modern way to steam and puree all different kinds of food, and of course it makes the process of making homemade baby food easier than ever because no pots, pans, blenders or food processors are required. A total Mom win. Beaba's Babycook is a 4 in 1 baby food maker, which allows you to steam, blend, defrost and reheat all with one machine. You can steam, cook and puree food in as little as 15 minutes and as a Mom of three I love the time-saving aspect. The Babycook Plus model allows you to make two different sets of food at once, which comes in so handy when Della's big sisters want to taste everything I am making, even though they are 2 and 4 ;) You want steamed broccoli mixed with peas for your afternoon snack?? Help yourself!! I love that the Babycook Plus design is sleek without sacrificing on function; it's something I don't mind looking at sitting on my counter on a daily basis, a definite perk because I keep it within reach for making Della's food fresh nearly every day. It takes me just a few moments to prep the food (usually just peeling and chopping) and then fill the water chambers for steaming and I love that I can easily combine different foods for new flavors all in the same containers. Another bonus is being able to steam veggies for our dinner on one side while prepping Della's meal on the other instead of getting out another pot and using our stovetop. Start to finish, it's incredibly user friendly and easy to clean. There are lots of accessories you can use alongside your Beaba Babycook as well. One of my favorite accessories are Beaba's clip containers (available in 2 oz, 4 oz and 6 oz sizes), which I use for storing freshly made purees in the fridge and packing snacks for her big sisters in my diaper bag. They can also be used to reheat and defrost food and with the built in vertical and horizontal locking mechanisms, it makes organization extra easy. We have been using Beaba's spoons as well and their multiportions silicone trays for freezing her food. 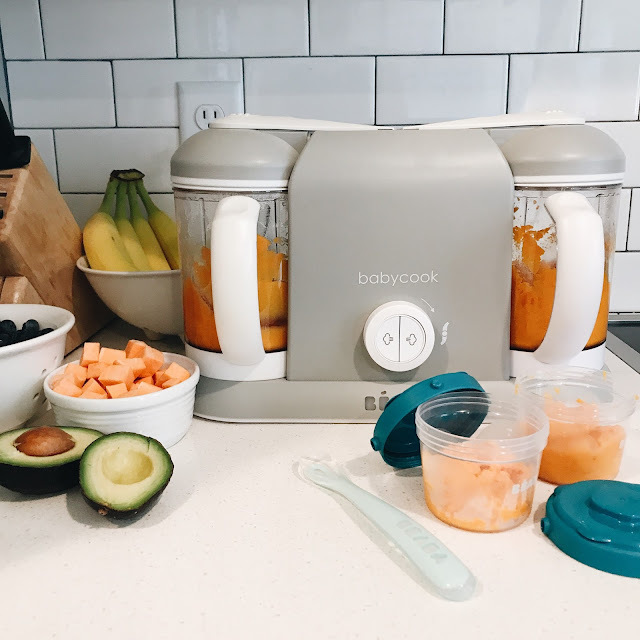 We have kept Adaline's diet pretty simple since she has only been on solids for 3 weeks, but I am excited to really take advantage of having the Babycook Plus model specifically, by preparing a fruit puree in one side and then a meat and vegetable puree in the other. Olivia and Penelope both loved wild caught cod & salmon as well as chicken and turkey (and still do!) so those are next on our list to introduce to Della. One of my favorite blends for Adaline is sweet potatoes, carrots, coconut oil and a little cinnamon. It's so simple but such "comfort food" and she loves it. 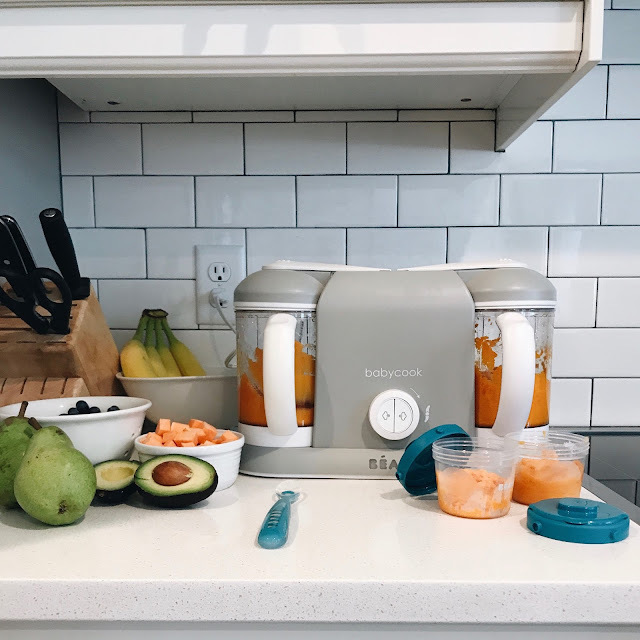 I also use our Beaba Babycook to make smoothies for the girls in the morning and for that, it has been a game changer! I'd love to know your little one's favorite foods, blends and recipes so we can add them to our lineup! Beaba's blog, The Crib, has tons of recipe ideas too so I am looking forward to trying lots of those, including this pumpkin one for Fall! It's Friday here for us since Dustin has tomorrow off and I am headed to get a massage this afternoon. Hope you have a wonderful weekend!! Let's be honest. Some days with 3 kids, the only thing getting us through the errand-running, nap-skipping, dinner-making, house-cleaning, laundry-folding, "please give your sister some space for the 1000th time" days are dance parties. There is just something about a good song that gets everyone feeling better in seconds. And watching my girls sing in the car, dance in their pajamas after breakfast or in the tub before bed is one of those scenes that makes the long tiring days all worth it. Summer is almost over but we are still jamming to a long list of our favorites. I thought it would be fun to share what we're playing these days incase you and yours need to hit the reset button and bust a move too! Happy Tuesday!! Hope you all had a wonderful weekend! We had a lifestyle session on Friday night and then took a day trip to one of our fav little towns, did some antiquing had a picnic on the river on Saturday. Sunday was a lazy day spent at home, which was just what we needed on a rainy day. We finished the night with big bowls of chicken chili and movies. If you missed my post two weeks ago, I shared a bit about a new series I've started on my blog called #TheMomBlogCollective; a handful of my favorite bloggers and I have teamed up to write blog posts twice a month, answering all the questions we get most often related to blogging, instagram, photography, collaborations, motherhood and more. You can find the first post in the series here. You can also search the #TheMomBlogCollective on instagram to find all the other posts sharing on these topics twice a month as well! This week is all about establishing your brand and building an online community. Creating a well-known brand and building an engaged community are two keys to creating a successful blog and instagram and really being able to do a lot with both -- such as collaborate with other bloggers & companies, promote products, get paid to blog and more. In the Week 1 post, I shared my top 5 tips on starting a blog and instagram and one of the tips was all about picking a blog name. That is really where your branding starts: picking a name that gets people's attention and tells your readers + followers what type of content you will be sharing but also that is memorable and has a ring to it. True story: When I was first launching my blog and trying to finalize a name, I knew I wanted the word "nest" in it because it would primarily be revolved around my home and family, especially as a new Mom. My husband is actually the one who came up with "A Blessed Nest" and as soon as he said it out loud, I knew that was it. It's easy to remember and in just three short words, it defines what I share about: my home, family, faith and motherhood. Remember that your blog name is the foundation of your brand; don't be afraid to play around with the wording until you get it just right. Another important part of establishing your brand is purchasing your domain so your blog URL matches your blog title. Whether you host your blog through Blogger or Wordpress (or another site), if you want to grow your brand you need to own your domain. That just means that your web address is www.Your-Blog-Name.com versus wwww.Blogger.com/YourBlogName or www.Wordpress.com/YourBlogName. It shows professionalism to companies and makes it especially easy for people to find your blog in online searches. You can purchase a domain through many different sites and pay as little as $9.99 per year. A third key aspect of branding is paying attention to the overall look of your blog, instagram and/or other social media accounts. The key is consistency across the board -- both in the name (you wouldn't want to name your blog one thing and set up your IG account with a completely different name; they should be similar, such as A Blessed Nest/@blessednestblog OR identical) and in the design. Creating a cohesive look to your blog layout, in your photos, across all your blog posts, etc. is part of staying consistent. If your blog is bright and airy but your photos are dark and underlit, it will seem like they aren't being done by the same person and comes off confusing to those following you. Personally, I think the most attractive blogs and instagram feeds are bright and white and easy to look at with the right mix of content and photos. We will be sharing more in Week 3 about instagram specifically and creating a cohesive feed as well as our tips for taking great photos, but keep in mind as you establish your blog the overall look of your blog is a reflection of your brand and you want a consistent look and feel in all areas. Finally, establishing community around your blog is what builds your brand and in turn, your following and your growth organically so your brand becomes more well known. 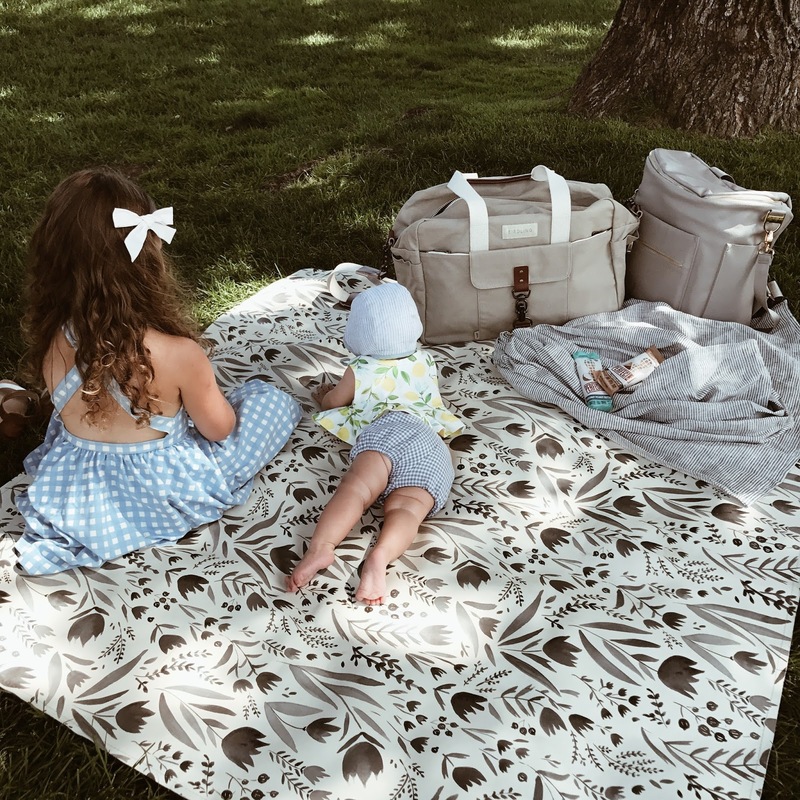 One of the very best parts about blogging has been seeing the community that I've created around A Blessed Nest, both here and on instagram, and connecting with other young moms in similar seasons of life through the process. I love getting emails from readers that were so encouraged by one of my posts, or a DM from a Mom about how they saw this/read that and it has helped them so much or how they always look forward to something specific that I post or share about. Those are the messages that encourage me so much and without a community, they wouldn't exist. 1. Start following other blogs and instagram feeds you admire or enjoy! You don't need to follow every single one that exists (because really, that would be nearly impossible), but start by following along with those that you love reading and seeing the most. Interact with them by commenting regularly on their blog posts and instagram or "liking" their photos. I have gotten to know some of my closest blogging friends because I was either first following them or they were first following me and we started interacting through comments and a friendship grew from there over mutual interests and similar life seasons. 2. Collaborate with other bloggers. As you get to know bloggers and find ones that have a similar style or niche as yours, work together. Ask if they would like to host a giveaway together, or to do a collaborative blog post (such as our Mom Blog Collective series), or even to just do a Follow Friday on instagram, where you get a group of 5 moms and create a 4-photo collage (using one photo from each of the other 4 feeds but not your own) to post on instagram on a Friday, tagging them and sharing why you love following along with them. I collaborated with so many bloggers throughout my first year of blogging and still do; getting my name, face and brand out there through these collaborations was a big key to my growth. 3. Remember that a community is different than an audience; an audience passively watches (or in this case, reads) whereas a community interacts, shares and participates. You want those who follow you and read your blog to be people that interact with you, share your posts and tell others about your blog so your following grows, right? To have this -- a community that is engaged, interacts and shares -- you need to be sure you are doing the same. Interact with your followers. Comment back. Open and reply to DMs when you can, even if you can't get to all of them. Sometimes I do an instastory and get 50+ DMs in a matter of minutes. Obviously, I don't have the time to reply to every single one (at least not right in that moment) but I open one or two and respond to a question or comment and without fail, I get the same response every time -- "Thank you so much for responding!" or "I appreciate you getting back to me so quickly, thank you!" etc. etc. When you genuinely interact with those who follow you, whether by replying to comments on your blog, instagram, emails or DMs, your followers will recognize that and your community will grow. 4. Share the content of other bloggers. Just as you would hope others would share your posts, do this for others! I love sharing articles or blog posts that really resonate with me within my blog posts or on my Facebook page. When people post on instagram asking about who you love following, tag your favorites and share why! Remember that as you help others be seen, be heard and grow, you will grow alongside them. You will reap what you sow. 5. Be genuine. Perhaps the most important piece of your branding and building a community is to really just be genuine by being yourself. Remember that blogging, instagram, social media...it's not a competition. We are all just trying to put our best foot forward, connect with each other and create memorable content that encourages, uplifts and inspires. Not everyone will read your blog or follow along or love your posts, and thats okay. I'm not doing what I do for the approval of others; I'm doing what I do because I love to do it! Being genuine in your writing, your posts, your photos and your interactions with your followers is what draws people to you. You can tell pretty quickly whether a blogger is down to earth and genuine or not; staying true to who you are and being real with those who follow along is going to get you far! We are almost halfway through August and I am convinced that the more babies I have, the faster time flies. Olivia starts school in about a month, so we have been enjoying all that summer still has to offer. Lots of playgrounds, splash pads, park picnics and evening walks before bedtime; the girls love putting on their jammies and going on a "pajama walk" after dinner. They bring their flashlights along (even though it isn't quite dark out) and love to sing bedtime songs on the ride. As for us, Dustin is still super busy at his job, putting in 50+ hours a week right now. I hosted a baby shower on Sunday for one of my best friends to celebrate her first baby arriving next month and planning our Fall family calendar is in full swing! Dustin and I are leaders in a marriage group in our church (this will be our third year doing that) and then we host a small couples group in our home once a month with our best friends, so we are excited for the kickoff of that. The two moms groups I am a part of also start up again next month, which is always something I look forward to as Fall approaches. We have family photos this upcoming weekend and then the State Fair is just two weeks away, which is one of the very best (and most delicious!) parts of summer here! We are hoping to get to the waterpark at least once this month, back to the lake for a weekend visit and then check out a few new parks with friends over the coming weeks. In other exciting news, I recently accepted a part time job at our Chiropractic Wellness clinic. Ever since we started going there, I have wanted to work there and be part of the amazing team, especially because I have such a passion for holistic health and pursuing a natural lifestyle and whole-heartedly believe the reason our girls are such great sleepers, so healthy/rarely sick, generally in great moods, great eaters etc. is because they have all been adjusted since birth. It is an all-women run, Christ-centered clinic and you guys, aside from being a Mom it is my dream job! My official title is "PR Creative Director" so I will be there every Monday afternoon for team meetings, event planning, event promotion, new product launches and demos, etc. and then I will be working from home as it works with my schedule doing their newsletter, social media and focusing on their online presence. They have been amazing at working with my schedule and accommodating to my needs in having a young family. In every way, I can just see God's favor and plans all over this new opportunity and am so grateful for the new adventure. I love staying home with my girls, but also wanted to do something that was just for me. Something I didn't have to share. But without being away from them more than one afternoon a week, because I would just miss them too much. So it's a great balance of "me time" and getting to pour my gifts and energy in to something I love doing, while being surrounded by women I look up to and can learn from. I'm so excited to share a new series I am starting here on my blog called #TheMomBlogCollective. Twice a month, a group of 10 of us will be sharing a blog post on the same topic -- related to blogging, instagram, working with brands, creating sponsored posts, photography, motherhood and more. More than almost anything else, each of us get asked how we started blogging, what tips we have for someone looking to start, how to work with companies for sponsored posts and more, so those questions are the starting point for our series. 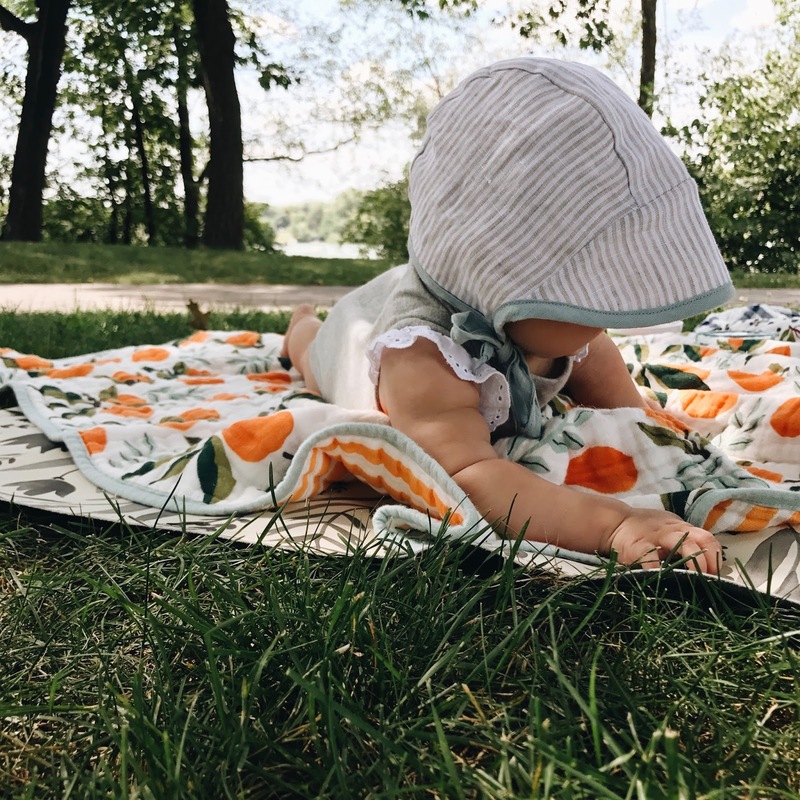 I began blogging in 2013 very casually, after my first daughter was born and I found myself as a Stay at Home Mom with extra time on my hands during naps. I wanted a way to connect with other moms in similar seasons of life, while also sharing my journey as a new mom and having something to look back on as Olivia grew. I also started an instgram account around that time, though I had very few followers and I basically posted whatever I wanted, bad filters and all. Over time my blog and instagram evolved to become so much more than I imagined they would be, and in 2015 is when I really feel like I got serious with building my brand and following and reaching out to work with companies I believed in and admired. So here are my Top 5 Tips! I get asked most often "how do I start?" and my answer is always the same -- just do it! Even if you have no idea what you're doing, get started. I had no clue what I was doing (and knew nothing about the blogging world) when I began back in 2013. Heck, I barely even read blogs! Almost everything I have accomplished was self-taught, day by day and one piece at a time. I didn't know anything about HTML, SEO, instagram, social media, or what the mom blogging world even involved. I just decided to jump in feet first and go for it. The sooner you start, the better. Something to continually keep in the back of your mind as you begin blogging is that one of your ultimate goals is to "create a brand" -- this will help you grow, establish relationships with other brands, get paid to blog and more. We will be sharing more on this specific topic in a few weeks, but as you grow, your brand is what you will be known for, which is why picking a blog name that fits with your brand is so important. Choose a name that is easy to remember, has a ring to it, isn't too long, and in just a few words tells your readers what you will be blogging about. For example, A Blessed Nest. It rhymes and is only 3 words long, but it tells you that I will likely be blogging about my home and/or family. Picking a solid, catchy name from the beginning is key. Most bloggers either host their blogs on Blogger or Wordpress, both of which have advantages and disadvantages, for example Blogger is free and Wordpress is not. You can select which you would like (google "blogger vs. wordpress" for some more information) and create a blog at your preferred location. You can then buy a pre-made template inexpensively with all the HTML online or from Etsy (unless you are very experienced in it) that you will then input in to your blog's formatting and it will set up your blog to have the exact look you want, including the font, layout, and more, without having to write all the HTML yourself. If you hire a professional web designer you are going to pay much more, but you can find some pretty simple and classy layouts on Etsy for $30 or less. The easier your blog is to navigate, the better. I always lean toward a black and white theme, lots of white space, and easy to read fonts, because it is not only better for my readers but also more professional, something to consider when you begin approaching brands. This may seem obvious, but the only way to build a blog and following is to start blogging. Decide what you want to focus your blog on, which should go hand in hand with your blog title, and start. Even if you have no one reading your first few posts, keep writing. I'm pretty sure less than 10 people followed me on instagram when I first began and my photos would get like 3 likes. Ha. Don't let that discourage you if you are starting with no one following along. Remember that ultimately you are doing this for yourself, as a creative outlet, or a way to connect with others, or to document your journey as a Mom. While blogging is a lot of work (and a lot more than I think most people realize), I blog because I love doing it. I've always told myself if I ever get to a point where I no longer love what I'm doing, I will stop. This is one of the hardest parts when first starting because it can be scary to share who you are and what you are writing about for fear of being judged or criticized, but creating social media accounts that go along with your blog -- or picking one specific account to focus most on (mine would be instagram) -- is a great way to begin making your blog known, and connecting with other bloggers to collaborate and build a following. Having a go-to social media platform that aligns with your blog (for example, with a similar name or the same name) will be the foundation for building your brand, cross-promoting your blog posts and working with other brands. Influencer-marketing is so huge right now and is primarily done on instagram, so if you are unsure of what social media platform to pursue, that is a great place to start. After you create an instagram account, you can begin by following bloggers you love and whose style you admire. Just by following along with them you will learn tips and tricks along the way. Being active and engaging with those you follow and those who follow you is another way to become better known. Remember that growth for your blog or instagram doesn't happen overnight, but if you continually put forth genuine, authentic content, you will be seen and become known. Check back for our next post later this month! Hope your week is off to a great start! !